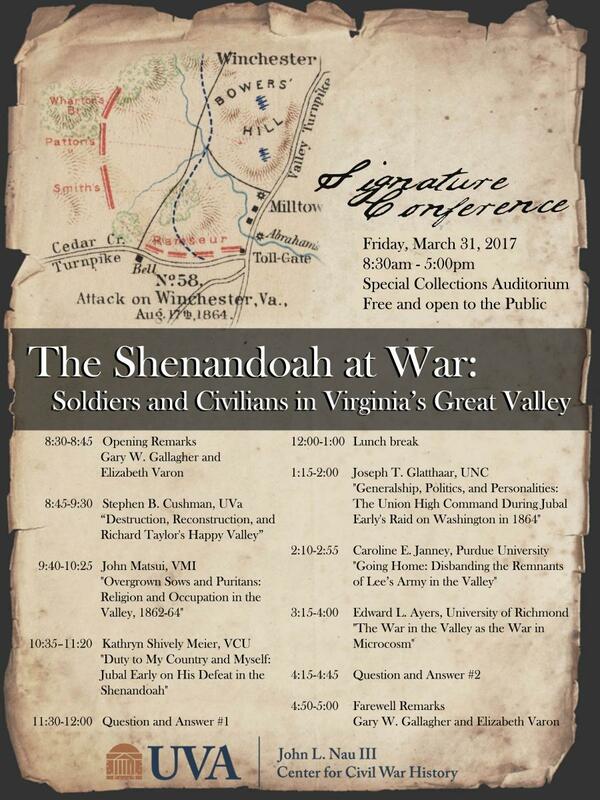 The Center’s signature conference for 2016-2017, “The Shenandoah at War: Soldiers and Civilians in Virginia’s Great Valley,” will be held on March 31, 2017. Speakers will include Joseph T. Glatthaar of the University of North Carolina, Stephen B. Cushman of the University of Virginia, Caroline E. Janney of Purdue University, Edward Ayers, president emeritus of the University of Richmond, Kathryn Shively Meier of Virginia Commonwealth University, and John Matsui of the Virginia Military Institute. The lecturers will address military and nonmilitary dimensions of the Valley’s experience during the Civil War, as well as the ways in which the Shenandoah figured in postwar memory. The event will be held in the auditorium of UVA's Special Collections Library. The conference is free and open to the public. Paid parking is available nearby at the Central Grounds Parking Garage.